The Freeway Faceoff is about all that's left to motivate these teams while Southern California's hockey renaissance ends with a thud. Dustin Brown and Kyle Clifford also scored first-period goals, and Jonathan Quick made 18 saves in the Kings' second win over Anaheim this season. There are two more meetings in the Freeway Faceoff over the next four weeks, putting some excitement in the Southland before both of its hockey teams likely miss the playoffs in the same season for the first time since 2004. "We're both not in playoff spots, but we're still playing for pride," Clifford said. "And they're always a rival over there." There's always a spark when the rivals get together, but the Kings had enough resilience to beat the Ducks again despite going scoreless in the final 43 minutes. "You knew right off that it was a pretty competitive atmosphere within both teams," said coach Willie Desjardins, whose first game behind the Kings' bench was a 4-1 win over Anaheim on Nov. 6. "If you look at their history, both of these clubs have had really good teams for a number of years, so it's not surprising that they've played in lots of big games. It's always good when you get to be a part of a challenge like that." "First half of the game, not even close to good enough," Silfverberg said. "We've been playing pretty good, but that was a step way back. We got flat-footed against a team that wanted it more. We kind of turned it on in the third period, but it was too late." Honda Center wasn't completely full when the puck dropped on the clubs' 139th regular-season meeting, but the sellout crowd eventually arrived while Brown and Sprong traded goals 65 seconds apart in the opening minutes. Clifford then put Los Angeles ahead with his career-best eighth goal midway through the first period. 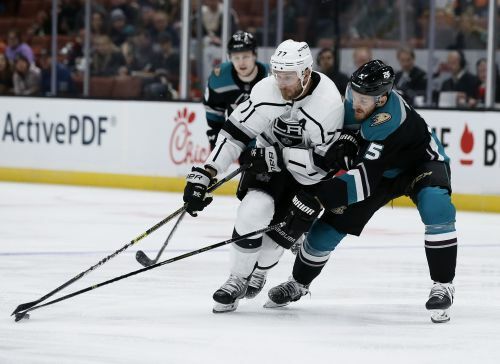 The Kings held Anaheim to two shots in the opening period and took a 3-1 lead when Grundstrom nimbly converted Adrian Kempe's pass on a rush. Grundstrom, a 21-year-old Swede who came up from the AHL on Friday, joined Brian Boyle as the only rookies in Kings history to score a goal in each of their first two games. After a scoreless second period, Silfverberg emerged from behind Quick's net and trimmed the Kings' lead on an unassisted goal with 7:44 left. The Ducks couldn't even it late, losing to the Kings for just the 10th time in their last 27 meetings. "In the last six or seven games, we've been the better team in the majority of those," Ducks assistant coach Marty Wilford said. "Tonight was a slow start, and it's tough to chase the game, as we've learned all year. It's tough to catch up, especially against a team like LA. There really wasn't much space. They checked very hard." NOTES: Boyle scored in each of his first two games for Los Angeles in February 2008. ... Silfverberg has points in a career-best five straight games. ... Ducks C Ryan Kesler missed his second straight game with a hip injury. The 34-year-old veteran had major hip surgery before last season, and he has just eight points in 60 games this season. ... Kings F Brendan Leipsic was scratched for the first time in 59 games. He hadn't missed a game since Los Angeles claimed him off waivers from Vancouver on Dec. 3.